Why oh why don't people believe that a curse has been put on your family so that swimming is a big no-no? Rowen's husband is sure he can protect her if she goes in the water-----yeah right. As she slips and slides all the way down she spots a submerged car. Luckily for Rowen her husband is able to save her---but not from her intuition which as usual is spot on! There is a body in the trunk of that car. She and her husband are asked by the police detective (who just happens to be in a relationship with one of Rowen's cousins) to please do some private investigating. It takes them to a part of town that really hates witches!! Talk about perilous!! Will Rowan figure out who was murdered and who did it and what exactly will she do about it? Meanwhile Rowen's two eccentric aunts have decided that they are going to get married---an intervention is held--but will it work? And will everything work out? I think you will think it does. One lesson to be learned-- the Lainswitch witches should not go near water!!! It’s a lovely day beachside. Rowen and company are enjoying the sun and each other. Despite a pesky curse that prohibits the Greensmiths from venturing too deep into any body of water, it’s really shaping out to be a nice afternoon! …Or at least it was until Rowen stumbles upon the charred body of a man hidden away in the trunk of a submerged car. Rowen and her husband Eric are tasked by local police to look into the matter. Their investigation leads them to Lichen Hallow, a small community in their little town of Lainswich. Lichen Hallow isn’t particularly welcoming to outsiders. Worse than that, they’re especially distrustful of witches in particular. Rowen and Eric will have to tread lightly, attempting to conceal their own identities in the process. To make matters worse, Rowen’s aunts, Lydia and Nadine, have new beaus on the brain. Their relationships are moving much too fast for comfort. Will Rowen be able to juggle family drama and a murder case that’s quickly becoming dangerous? Probably not, but she’s got to try. 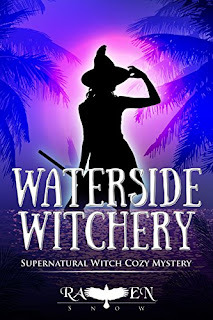 Twelfth Volume of the Lainswich Witches Mystery Series. Approx. 50,000 words in length. It is a standalone (reading prior or future volumes not required to enjoy the book, no cliffhanger). If I ever come across a city named Lainswich I am staying far away. I can't believe they are number 12 already. Especially away from Raven and Eric those two, well Raven always finds trouble. I like that these books are not gory or anxiety provoking actually kind of a fun read. I love when a series doesn't have to be read in order. I have a feeling I'm going to like these characters.